"Jacksons bequest really goes beyond generous. It was like Texas itself: an outsized, can-you-top-this grand gesture that, ultimately, is an expression of deep love for an institution and a state that reward  and are rewarded by  big doers." Every Thursday at 2 p.m., John A. Jackson would drop by Bill Fisher's office. That was in 1984, and Fisher was then director of the Bureau of Economic Geology, which is also the Texas State Geological Survey, and chairman of the Geology Foundation for the University of Texas' Department of Geological Sciences. Jackson is an honorary member of the Foundation's advisory council and one of its regular donors. Jackson, a 1940 geology graduate of the University of Texas, had been a geologist for a few years but by then was working as a businessman and entrepreneur. And Jackson was becoming an investor. "He never likes to be called a philanthropist. He says, I like to be called an investor. Fisher says. "That's why he puts his money where he thinks it's going to do some good. That's why he's invested in education, hospitals and health." In March, University President Larry Faulkner announced that Jackson, who has no children, had informed him of his intent to leave the residue of his estate to the Geology Foundation, the funding organization for the Department of Geological Sciences. According to Jackson, the gift is currently valued at between $150 million and $200 million, making it one of the largest received by a public university and, in particular, by one department. Jackson had already given $15 million to fund the construction of a new geology building, and $25 million to start the John A. and Katherine G. Jackson School of Geosciences. And he had long ago established specific endowments for the Foundation. The gifts grew out of a long friendship between Jackson and Fisher, a Texas geologist who has led both the Department of Geological Sciences and the state's geological survey during his career and is director of the Jackson School. Jackson and Fisher still talk every week to discuss geology, education, business, what needs doing. John A. "Jack" Jackson (left) and Bill Fisher have talked every week since 1984. Jackson has given generously to promote geosciences at the University of Texas at Austin. Image by Marsha Miller, UT-Austin. As early as their first meetings, they'd talk about how Jackson began to make his fortune in the 1950s in Wise County, Texas, in a natural gas field that still produces today. In 1948, when Jackson started as a consultant for oil companies drilling in the county, the consensus was that the area couldn't produce. But Jackson had seen some things, including bauxite fields in Arkansas, which he explored for the Navy during the war. Jackson applied a similar geological model in Wise County as the one he used in Arkansas. He concluded that the gas accumulation in Wise County mirrored the bauxite accumulations: the conglomerates containing bauxite in Arkansas and containing natural gas in Wise County accumulated around the flanks of buried hills, rather than at their tops. "So he decided to drill in the structural lows and on the flanks, and everyone else was drilling on the structural highs," Fisher says. "And where everybody was drilling dry holes, Jackson started making discoveries." The result was Boonsville, one of the largest gas fields in Texas. The financiers who eventually bought the gas field guaranteed Jackson 5 percent of the gross from each well drilled. Back in 1956, according to an article in Time magazine, Jackson was slated to earn $200,000 a year for the next 20 years from the field. Jackson still earns income from the field today . In 1959, Jackson co-founded Milson Petroleum. After that company dissolved, Jackson named his new company Katie Petroleum in honor of his wife. He stopped geologic fieldwork and settled in Dallas to start investing in land. (He gave up geologic fieldwork, Fisher says, when his wife declared one day that she should have married a shoe clerk, because then she would actually see him once in a while. After that, Jackson changed his priorities and never spent a night away from Katie until her death last year, Fisher says). Eventually, Jackson acquired land in the Dallas area, some of which is now the Dallas Tollway. Jackson sold the land to the state in exchange for transit authority bonds, which still produce revenue for him today. "I got to know Jack rather well," Fisher says. It wasn't long before Jackson started to give Fisher hints about his fortune. "He wasn't bragging about it. But he was just letting me know that he was capable of doing a great amount of things." Over time, Jackson gave the foundation $500,000 in endowments. But he was only warming up. One day in 1991, Jackson and Fisher met at the Hyatt Regency in Dallas. At that meeting Jackson indicated to me the order of magnitude of what he planned to do, Fisher says. Jackson, who is 88, and his wife, who passed away last year, have shared their wealth generously. By 2000, they gave the Geology Foundation some $500,000 for specific endowments, and $15 million for a new geology building, which is under construction. They have also given to Texas Lutheran College, libraries in Decatur and Bridgeport, and to the Presbyterian Hospital in Dallas. In 2001, the Jacksons gave the department $25 million to start the Jackson School of Geosciences. The school unifies the university's three geoscience research centers: the Department of Geological Sciences, the Institute for Geophysics and the Bureau of Economic Geology. Each center has its own location, history, mission, funding structure and culture. "It's been something we've been pushing for for a long time, but we haven't had the resources to make it work," says Peter Flawn, a professor of mineral resources, past president of the university and a past director of the Bureau of Economic Geology. 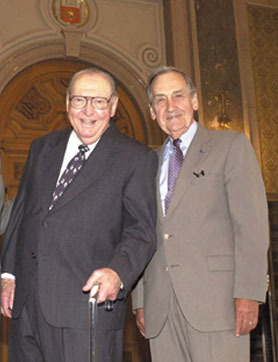 Flawn and Fisher worked together to establish the Geology Foundation in 1953. With Fisher as its chair, the Geology Foundation will work with the Jackson School to manage the Jacksons' gift. "What we really needed, Fisher says, "was an incremental source of money above and beyond that already in the Foundation that would serve as the glue, the cohesion, that would begin to bring the thing together. The Jackson money of course starts to do that in grand style." Jackson pledged $25 million to begin the school, giving $5 million a year over five years. The money so far has allowed the department to buy the time of researchers at the Institute and the Bureau, says Gary Kocurek, department chair.
" You're taking three units and getting them under one umbrella. You're tripling your resources," Kocurek says. "We'll be able to bring more people from the outside to cover course load. We'll be able to buy professorial time. We can give sabbaticals, and allow people more productive time. For people here, it's not a question of want or desire or willpower. It's just a matter of so many hours in a day." The idea is to enable Bureau and Institute scientists to teach classes at the department and to secure a status change so that they can function as student advisors. "It's already helped us in working better with the faculty in the geology department and at the Bureau. The students are the beneficiaries," says Paul Stoffa, director of the Institute for Geophysics. The school will also use the Jackson money to lure in top graduate students, Fisher says. Starting this fall, Fisher says, every graduate student admitted will have tuition fully paid for their entire stay at the school. Kocurek has seen the difference. For fall 2002, he says, 65 percent of the school's offers to new graduate students were accepted. Usually they see a 50 percent acceptance, he says. "They're really good about not letting you starve," says master's candidate Liz Roller, who earned her undergraduate degree from Colgate University. "This place offered me the most money." Master's candidate Chris Edwards is also very happy, although he agrees that unifying the department, Bureau and Institute will be an advantage. He's taken his share of 40-minute bus rides from the campus to the Bureau to work with a researcher there. "It's a stumbling block as far as location. There's an incentive to go because of the people. But it would be good if they were all together." The University of Texas and its fellow state flagship, Texas A&M University, have historically been two of the country's better funded public universities, thanks to the Permanent University Fund. The fund is an endowment that provides the university systems revenue generated from public lands. In 1883, the Texas legislature set aside about a million acres in West Texas for the fund, thinking the land had little commercial value. It turned out to be rich in oil, and by 1925 was adding $2,000 every year to the Permanent University Fund. It is now valued at about $7 billion. But while the fund used to be the principal source of income for the University of Texas, it now only supplies 10 percent of the school's revenue. According to a recent article in the Chronicle of Higher Education, this decrease is due in part to the fact that the two university systems, and the fund, now support 17 campuses. And the share of the fund from oil and gas royalties has been declining. "The source of substantial growth in these kinds of climates we're in now, and have been and are likely to be in the future, has to come from other sources," Fisher says. Contributions to U.S. colleges reached a record last year, according to a study by the Rand Corporation Council for Aid to Education, which surveys universities each year on the amount of voluntary gifts they receive. The trend for universities to rely on private gifts has been going strong since at least the early 1990s, says Ann E. Kaplan, who directs the Rand survey. Still, she adds, the private gifts, on average, fund only 10 percent of most universities' expenditures, which means the education institutions still depend on state and government funding. "Even if this trend continues, it's not going to be the primary source of funding for higher education. For certain programs it is, for certain gifts that make entire programs possible, they're very important in what they fund. But they don't run the university." For the Jackson School, Fisher says, the Jackson gifts will fund growth and will make possible a vision he and other leaders within the department have contemplated for decades: to unify the department, the Institute for Geophysics and the Bureau of Economic Geology. In February, Fisher and Mary Anne Rankin, dean of the school of natural sciences, which encompasses the Jackson School, traveled to Dallas at Jacksons request to help him write a letter to the university's president. In the end, it read, "I write to confirm my intent to commit the residue of my estate to the Geology Foundation of the University of Texas at Austin. This is intended to be an investment made on behalf of me and my late wife, Katherine G. Jackson." Defining the scope of the Jackson School, the letter continues, "It is my desire that the John A. Jackson and Katherine G. Jackson School of Geosciences and the John A. and Katherine G. Jackson Endowment in the Geology Foundation address the subjects of geology; geophysics; energy, mineral and water resources; as well as the broad areas of the earth sciences, including the Earth's environment." Thus the letter laid out what Fisher and Rankin see as an interdisciplinary mission for the Jackson School and for Jackson's gift. "There's a whole area of endeavor that's not only in the Department of Geological Sciences: water resources, Earth, the environment," Rankin says. "When we have this additional funding, we'll be able to elevate to another level. By bringing in really strong faculty and students in our areas, it will enrich other areas intellectually. It's a very synergistic, positive, reinforcing phenomenon." Jackson announced the gift now so that the school and its leaders could start planning how to use the eventual $150-million endowment. "It actually gives us a bigger responsibility to change and prepare and plan things wisely," Stoffa says. With what Jackson has already given, the gift will eventually amount to about a quarter of a billion dollars, along with the current assetts of $50 million in the Foundation, Fisher says. It is a large gift. But it funds a large school, Fisher adds. Because it combines the approximately 130 professors and researchers of the department, Bureau and Institute, and because the department is teaching about 300 graduate and undergraduate students, "it is probably the largest geoscience enterprise in the country," he says. And a large enterprise requires money, Fisher adds. He is echoed by Kocurek and by Scott Tinker, director of the Bureau, when he says that one goal is to use the Jackson money to garner even more money. Tinker cites one of the Bureau's programs, the STAR program, in which Bureau researchers help small and independent oil companies understand resources in the state. The money companies make from using those resources goes back to the university through the Permanent University Fund. "And that's exactly what we need to do with the Jackson school money," Tinker says. "Every dollar there needs to be leveraged in some form, both in terms of integration, and in terms of economic leveraging." Matching grants is another leveraging tool, Kocurek says. "So Jackson money doubles or triples. Everything is matching money. We have a much more competitive grant proposal we can put out there because we can match the money." Leveraging has been a key tool for the University of Colorado's Coleman Institute, founded recently from a $250-million gift from Bill Coleman, founder of BEA Systems, and his wife, Claudia, a former manager with Hewlett-Packard. It matches grants that university researchers receive, says Enid Ablowitz, director of advancement for the institute, and she says they have definitely noticed a difference in the competitive edge that leveraging power gives the university's researchers. The other key tools are partnerships and interdisciplinary research. The institute formed out of a vision between Coleman and the university's president, Elizabeth Hoffman. It spans the university's four campuses and rewards research in several disciplines, as long as research meets the mission of advancing the quality of life of people who have cognitive disabilities, Ablowitz says. "We're redefining the whole field," she says, because they are working beyond the university's walls and traditional scientific silos. Ablowitzs advice to the Jackson school? "Don't do business as usual." For example, she says, create endowed professorships that will bring in more top earth scientists who can help delineate the field's biggest problems. Host a conference that will harness ideas from the world's leading earth scientists. Use the gift as a catalyst to create a leading think tank. "Take a big gift and do something big. Look at interdisciplinary approaches to solve big problems." Fisher says the Jackson school leadership, along with the 40-member advisory council of the Geology Foundation, will use the Jackson money to fund large research initiatives, beginning with an initiative to study water resources in the Southwest. "We want to identify fairly broad areas that we can make a multi-million dollar commitment to over a period of 10 to 20 years," Fisher says. "The kind of thing that you can make a real impact in a particular area. And particularly areas that may be novel, may be new." Otherwise, the Jackson gift will create a large, long-lasting endowment for a large geoscience enterprise. "The whole point of the school is to provide an organizational entity that will accommodate the breadth that is the Earth," Flawn says. "We're going to be very deliberate about it. I think the leadership here is determined that Mr. Jackson not be disappointed in what we'll be able to do with his gift." Editor's note: The first initiative the Jackson School of Geosciences would like to pursue is researching water issues in the Southwest. The situation along the Rio Grande River is a good example of the need for more information about the area's water resources. Despite the recent flooding in the Hill Country of Texas, a long-term drought grips the border region. As the water supplies have dried up, sniping has erupted along the border over Mexico's failure to honor a 1944 treaty calling for the delivery of 350,000 acre-feet of water each year to the lower reaches of the Rio Grande River. Much of the watershed feeding the Rio Grande, called the Rio Bravo in Mexico, is a desert, and the areas drained by the Mexican tributaries that are supposed to supply the 350,000 acre-feet are no exception. The Rio Conchos - which flows into the Rio Grande near the cities of Ojinaga, Mexico, and Presidio, Texas - typically supplies as much as two-thirds of the surface water which sustains life and industry along the lower Rio Grande. The Rio Conchos drains a portion of the Chihuahuan desert - a high, hot desert characterized by wide expanses of creosote bush, mesquite, ocotillo and lechuguilla. The drought that has parched southern Texas has stricken the Rio Conchos basin, too. Mexico has fallen back on its treaty obligations, owing a cumulative debt of 1.5 million acre-feet of water, according to news reports. Despite a recently negotiated agreement for Mexico to repay about 90,000 acre-feet of water owed to the United States, Texans are angry at what they perceive as Mexican foot-dragging. The fact is that people on both sides of the border are suffering. People are struggling with two main questions. First, do water quotas negotiated nearly 60 years ago - when the population of the region was nearly a 10th of current levels - make any sense today? And second - keeping future growth projections for the region in mind - is demand for water exceeding demand for an incredibly limited resource? Neither of the major agreements (in 1906 and 1944) regarding the allocation of Rio Grande water between the United States and Mexico were particularly well informed by extensive studies of natural variability in water availability in the region. While there was evidence of severe past, and current, droughts, it is only recently that researchers have made headway in determining the variability of the region's past climate. Henri Grissino-Mayer, a dendrochronologist in the Geography Department of the University of Tennessee in Knoxville, just completed a series of reports on the climate history of the central and southern portions of the Rio Grande basin in New Mexico. He concludes that the 20th century was a bad time to plan on a reliable water supply. "The 20th century is highly variable," Grissino-Mayer says. "It's probably the wildest century, in terms of precipitation variation, in the last 20 centuries." David Stahle, another dendrochronologist in the Department of Geosciences of the University of Arkansas in Fayetteville, agrees. Stahle has spent many years conducting tree-ring studies in northern Mexico. He has recently been collaborating with Sara Diaz, a graduate student at the Centro de Investigaciones Biológicas del Noroeste in La Paz, Mexico, in a tree-ring based reconstruction of precipitation variation in the state of Chihuahua in northern Mexico. "Fantastic decadal variability in Sara's reconstruction leaves little doubt about the dangers involved in water allocations based on limited hydrological records," Stahle said. Development on both sides of the border has been steadily growing since World War II, and had skyrocketed since the passage of the North American Free Trade Agreement, according to a recent report on cross-border water issues published by the Center for Strategic and International Studies (CSIS) in Washington. So far, it appears that economic development interests have taken little heed of the vulnerable water supply. "There has been a significant lack of long-term planning," says Meghan Bishop, a research assistant with CSIS. "What do you want the border to look like?" Bishop says that agriculture, which uses larges amounts of water but is vital to the region's economy, is in a fundamental conflict with industrial development, which brings with it cities full of thirsty people. "How do you balance agricultural needs with municipal needs?" she asks.